As an artist playing with fiber, when told of this project commemorating the monumental worldwide event my attention was captured. Creative expression has always been part of my life—the unfolding of moment to moment ingenuity. Interests in origins lead me to these representations of the historic Apollo 11 moon mission of 1969. 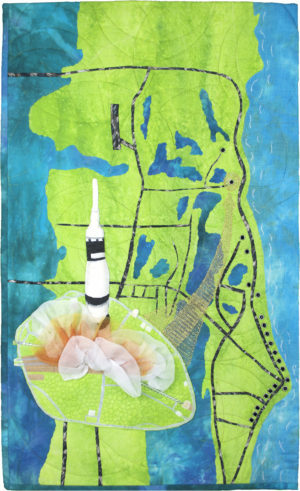 Depicted are the launch area map of the Kennedy Space Center Spaceport USA—its islands, waterways and lakes. Because the area is primarily swampy I chose a green background, blue for the backwaters, and a lighter blue representing the Atlantic Ocean to the east. The primary roads and bridges are included. Twenty nine launching sites used in the 1969 era are indicated. With a directional arrow to its location, a detail of Pad 39As relative shape, roads and structures is superimposed with a rendering of the Apollo 11 rocket firing at liftoff. My interest in beginnings continues in the materials used. One of my passions is dyeing fabrics with fiber reactive dyes. For this creation, I chose to hand dye and paint cottons, while other details and embellishments are commercial products. Information gleaned from the many websites I researched added to my knowledge of the space program. I admire the human dedication involved and share in their excitement when details worked as planned. I am happy to be included in this exhibition. I have great respect for Susanne Jones, the originator, her dedication and support to everyone participating. Artist’s hand-dyed fabric; trapunto; hand, machine stitched and raw edge appliqué; hand and machine yarn couching; beading; various machine quilting stitches; cotton thread hand embroidery. Artist fiber reactive dyed and hand painted cottons; polyester knits; organza; netting; glass beaded studs; cotton and metallic threads; cotton batting.